Hyperdrive - could the Millennium Falcon really travel faster than light? Star Wars is back! Disney is taking over LUCASFILM and they are planning to make some more Star Wars films. To celebrate this exciting news we are taking a look at the science behind the movies. 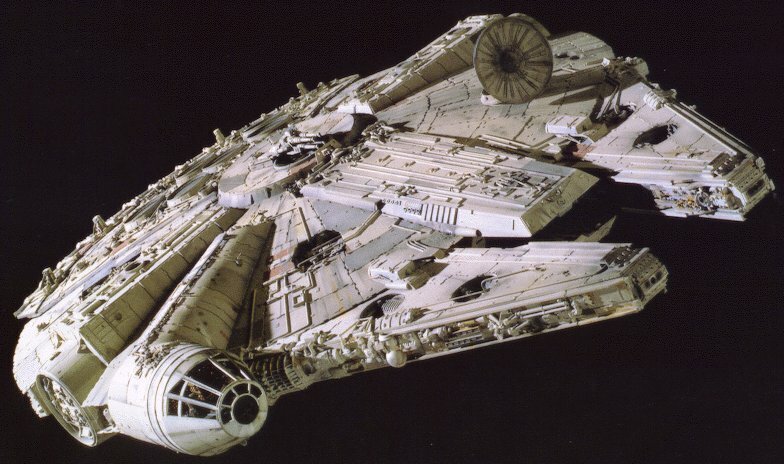 This week we will take a look at Han Solo's beloved spaceship, the Millennium Falcon. What is the Millennium Falcon? The Millennium Falcon is a starship used by Han Solo when he was a smuggler with his friend and partner Chewbacca the wookie. Although the ship ends up being an important part of the rebellion against the Galactic Empire in the Star Wars films, the thing it is most famous for in the movies is being fast - really fast! Han Solo once boasted that the Millennium Falcon was the fastest ship in the rebel fleet. The question is, will a spacecraft ever really travel faster than light? Just how fast is light? In other words, in the time it takes you to read the words "that's really fast", light could travel all the way round the world more than nine times! How is the Millennium Falcon supposed to work? You see, one of the problems of travelling at light speed is that if you bump into anythingm you're in BIG trouble. Even a speck of dust would punch a hole straight through your spaceship. No wonder Han Solo needed a good sat-nav! So, could faster-than-light travel ever happen? Not very long ago, scientists working in Switzerland thought they might have measured tiny particles called neutrinos travelling faster than light. Everyone got very excited, but unfortunately it looks like there was a fault with one of the instruments. That means that, at least for now, the Millennium Falcon will have to stay in fiction. But let's have a quick look at a couple of the ways people think we might have a tiny, miniscule chance of one day travelling faster than light. If there was some way in which we could create enough energy to bend and stretch the universe to create a bubble of time and space, we could make it travel faster than light. 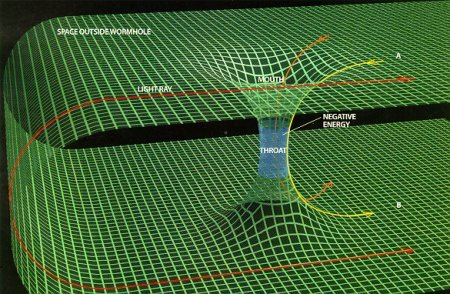 The trouble with warp bubbles is that not only would you need the energy of a whole sun to create one, it would have to be "negative energy", and scientists don't even know if that exists. You may have heard of black holes - tiny spots in space where gravity is so strong that not even light can escape the pull. Well what if one black hole connected up with another - would it create a tube that you could travel through? Imagine for a moment that you wanted to visit your cousin in Australia. You could fly round the world. Or you could just dig a hole right through the middle of the Earth and fly through that. Much quicker! Well, some scientists think these tunnels in space might be real. They even have a fancy name for them: Einstein-Rosen bridges. It's based on the idea that space and time curve round like the surface of the Earth. This means - like in our imaginary journey to Australia - you could have two black holes on either side which link up to create a tunnel or wormhole which we could use as a shortcut. One of the big problems with this idea is that, like the video above says, black holes are violent and destructive places. Going into one wouldn't be very sensible, even if you thought you might get safely out the other side! Could we ever travel faster than light and visit other stars and planets in our galaxy? Could we beat the Millennium Falcon in a race one day? Let us know what you think - if you come up with a good idea we might add it to this page. In the meantime - may the force be with you!